At left, Jen Maki, associate professor of chemistry, works with Paige Marsolek on a summer research project. The College's biochemistry program was recently granted accreditation by the American Society for Biochemistry and Molecular Biology (ASBMB). Jennifer Maki, associate professor of chemistry and department chair, said the 7-year accreditation is a mark of excellence for the biochemistry degree at St. Scholastica. "The ASBMB is the premier institution for biochemistry in the United States," Maki said. "They evaluated our program in categories including instruction, research, and diversity initiatives. This accreditation is a verification that our program meets national standards." This month, graduating biochemistry students will take the nationally administered certification exam. Those who perform well will graduate with an ASBMB-certified biochemistry degree. Additionally, exam results will be utilized by the chemistry department to annually assess and improve the biochemistry degree program. 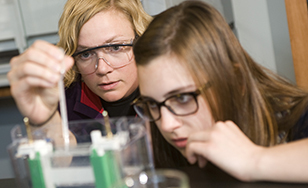 The majority of St. Scholastica's biochemistry graduates successfully pursue advanced degrees in biochemistry, molecular biology, and related fields or continue their education in medicine or pharmacy programs. The department faculty utilize creative and innovative approaches in the classroom and have a rich, decades-long history of conducting research in the laboratory with undergraduates. Paid summer research opportunities for students have been greatly expanded in the last two years, and students also benefit from newly constructed classroom and laboratory spaces as well as small class sizes.